• JSC (ZAO) «Plasmofilter» is a developer, manufacturer and supplier of high-technology medical products for efferent therapy and surgery. 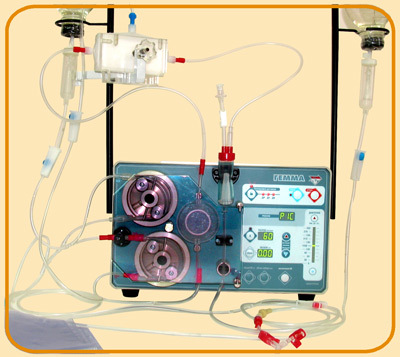 • In the field of efferent therapy the firm produces the whole set of products for membrane plasmapheresis (an apparatus «Gemma», plasma filters PFM-800 and PFM-500, circuit line systems, etc.). 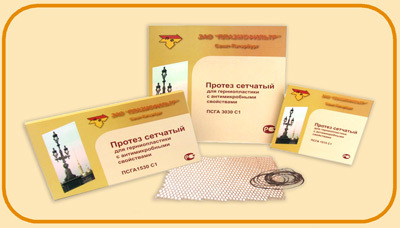 • Al the products have authorization (permitting) documents for use in Russian federation and in the FSU countries. 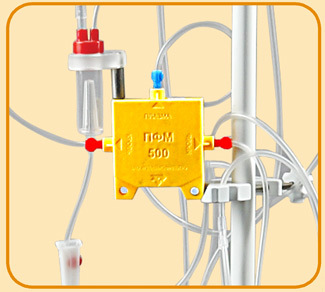 • The apparatus for plasmapheresis "Gemma" . • Membrane plasma filter PFM-500 housed in a tough polymer case. • For surgery needs the firm produces a hernia mesh with an antimicrobial properties and antimicrobial suture material. The PSМA is a polyester lavsan mesh, made of complex polyfilament threads with polymeric coating, containing silver nanoparticles, providing antimicrobial properties of the mesh. • Hernia mesh with antimicrobial properties (PSGA).